Fantastic Mobile Discos in Tunbridge Wells for your party provided by JMF Disco. JMF Disco is owned and presented by DJ John Padmore, a reliable, experienced Mobile Disco in Tunbridge Wells. My aim is to provide you with all the help you need, from your initial phone call to seeing your happy guests leaving after a wonderful nights entertainment, at your perfect party provided by Mobile Disco Tunbridge Wells. We realise that many people are unfamiliar with arranging weddings, birthday parties, children's parties, anniversaries, charity events, presentation nights and similar parties - often these are once in a lifetime events or arranged infrequently - so it is very important to get things right. By employing JMF Disco, not only will you get a great mobile disco playing your favourite tunes, ensuring you and your guests will have a great time, you also get to lean on our years of expertese to help you arrange a beautiful wedding reception or party and making the whole process as easy and stress free as possible. As part of the personalised Tunbridge Wells disco hire service offered, as well as great DJs in Tunbridge Wells, we will provide you with our special Party Planner Pack to help plan your evening and music just as you want - good parties do not just happen - they are created! As part of our mobile disco hire package we will provide you with our special party planner pack to help set out how you want the evening to run, timing of speeches and cake cutting, opening of buffet etc, you can list out all your favourite songs you want playing etc so that we all come prepared for what you want to happen and when, playing great music, with all your favourite songs that you and your guests will dance the night away to. Good parties do not just happen they are created and managed - together we can ensure yours is not just another average McDisco party. JMF Disco's Tunbridge Wells DJ service will provide you with the entertainment you want for your dream party - why settle for anything less? Call or email JMF Disco for your Mobile Disco Tunbridge Wells to find out how I can help you. Have a look at the Celebrations page for more details of the Mobile Disco Tunbridge Wells service I offer and call me to discuss how I can help make your evening very special. Contact Mobile Disco Tunbridge Wells on Tel 01795 429777, Mobile 07895 546183 or by email to discuss your Mobile Disco needs or questions. Showfileds Hall located in Rowan Tree Road on the southern side of Tunbridge Wells is available for hire for a variety of private functions and parties. as well as your house, local favourite pub, club, hall or marquee. Are you planning to welcome in the New Year in style? Get in contact with JMF Disco today for a quotation and explanation of how we can help you host a great New Years Eve party. Book early or you may be disappointed. 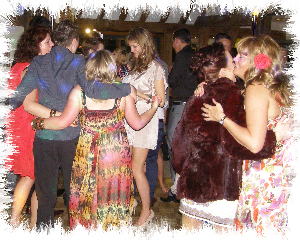 - I'm sure I can provide you with the great mobile disco in Tunbridge Wells you really want!